This is a gorgeous book. It features 25 projects that are a mix of functional and decorative items, carrying on a centuries-old tradition. Josh Nava is a hand carver in Nashville, TN, and is the co-founder of Suburban Pallet, which specializes in hand-crafted goods made from repurposed timber. 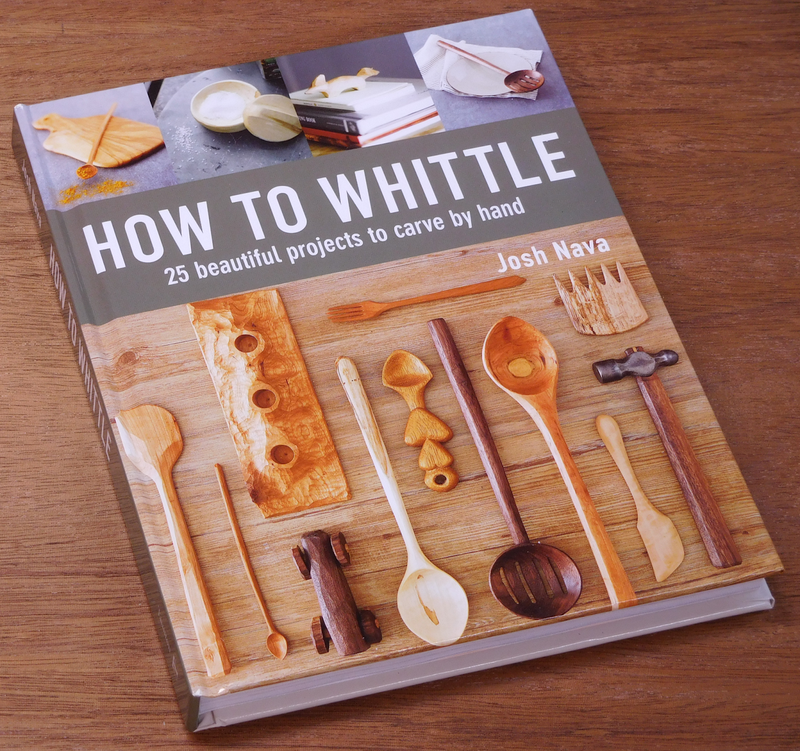 Whittling may bring to mind sitting around the campfire or on the porch, carving on some fallen twigs with a pocketknife to pass the time. The end result may be a memento to keep or just go into the fire. The items in this book are of a more permanent nature. This is what I know as treen or treenware, treen meaning "of the tree". Treen was common when everyday household items were carved from wood. 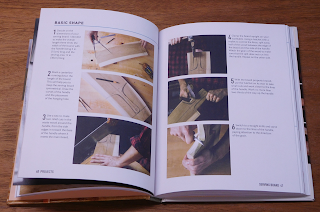 The book starts with a 20-page chapter on techniques, covering choosing wood, tools, sharpening, safety, knifework, preparing blanks, and finishing. The projects are covered in 112 pages, 3-5 pages each. It ends with a page on resources, and an index. One of the points Nava makes is that whittling is a very accessible craft. It requires few tools, and the work is done in green wood, using mostly found material. The results are beautiful and practical, useful for decades. Whittled items show a distinctive faceting that lends a rustic elegance and reveals their handmade provenance. These are personal. Meanwhile, making them teaches you properties of wood, elements of design, and hand skills. "Green woodworking" means using freshly cut or fallen wood that hasn't yet been processed or dried. I'm familiar with it from the books of Drew Langsner, as well as demonstrations by his protege, Peter Follansbee, and the work of Robin Wood. Nava does a wonderful job of distilling this into a concise, easy to follow book. The projects provide enough coverage to give you a wide range of capabilities. This book will have you scouring the neighborhood and countryside for fallen trees and branches. Wind storms will mean good harvest days. Here in New England, there's ALWAYS someone who has something down. It's a good way to use urban timber, so you might want to check with tree services and municipal maintenance departments for material. Knives: used for medium and fine shaping. These are somewhat specialized, particularly the hook knife. They're not common pocketknives. Small hatchets and hand axes: used to prepare blanks (that is, preparing tree trunk sections or branches to the rough blanks that will be shaped into objects) and for rough shaping. Folding saw: sufficient for most harvesting. You can find the knives, hatchets (including some very fine ones) and saws online, with a variety of commercial and custom products available. Remember that this is for green wood, possibly some fairly large branches, so a longer saw with coarse teeth is best; he recommends 10-14". Robin Wood covers some information on where to obtain knives and axes. While it is somewhat dated, you have the benefit of experienced opinion. As with any tools, investing in quality items will avoid heartache later, so beware of buying the cheapest based on price alone. The skill list is similarly short. For knifework, Nava goes through five cuts that he uses throughout the projects. To prepare blanks, he outlines five general steps. Nava opens each project with a page showing a photo of the finished item and a list of materials and tools. This was my favorite item. 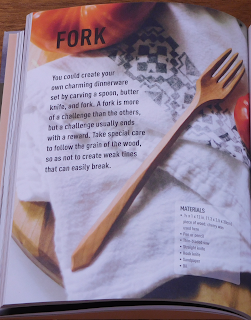 Look at the gorgeous faceting of that fork. 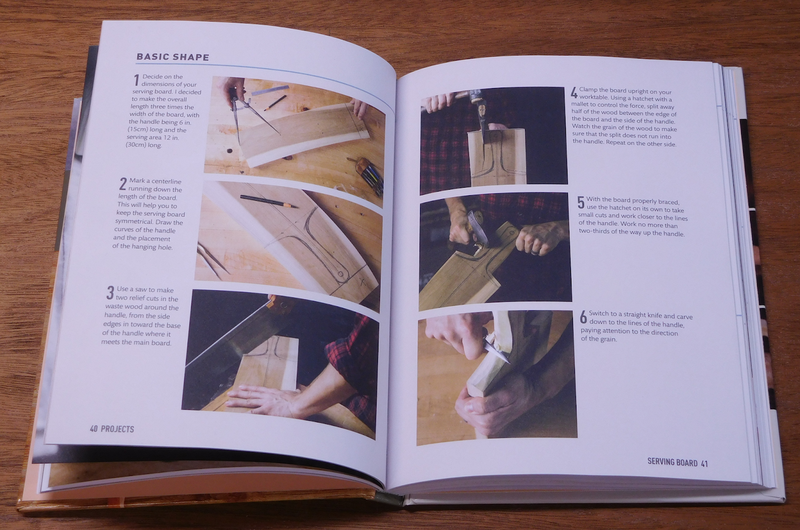 He covers each project in a series of steps over the next several pages, using clear captioned photos. The writing is very easy to follow. The whole process has a wonderfully relaxed, organic feel to it. The layout is easy to read and follow. Whether you use the item yourself, give it as a gift, or sell it, the user will always be reminded of the person who made it. That's the personal connection in such handcrafts. One thing I like about this is that you can use almost any wood. That means if there's a cherished old tree at a family house that you remember growing up, if some of it comes down, you can turn it into something that the family can continue to use for decades. It's also a completely portable style of woodworking that offers great satisfaction. A small canvas bag of tools can go with you anywhere, and you can leave behind works of art and function. If you sell your work, this is something you can do at fairs and craft shows. With your wares displayed for sale in front of you, you can be working on more the whole time. Then it's production and demonstration as well as commerce. This also offers an opportunity to engage an audience and pass on the craft. You can let people try the tools after a quick lesson on safety and technique if you're comfortable doing that. This is a wonderful book that will give you hours of enjoyment. Psst: Don't tell my wife, but I ordered the set of Mora knives, the Marbles camp axe, and the 14" Silky Bigboy 2000 with extra large teeth that I linked above. This looks like fun!